Well I'll be goddammned. WWE actually pulled off a really great Survivor Series PPV that for me even exceeded the miraculously good show from 2016. 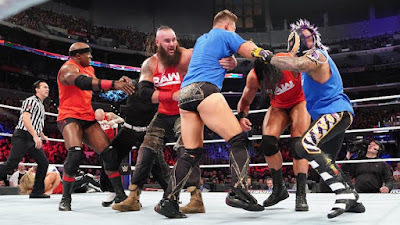 Including the pre-show match (which has to be one of the two or three best pre-show matches of all time), this had three very good elimination matches, four excellent singles bouts and only one throwaway tag match. In 2018 this is about as good a main roster WWE show as you could ever hope for. Let's get into it. 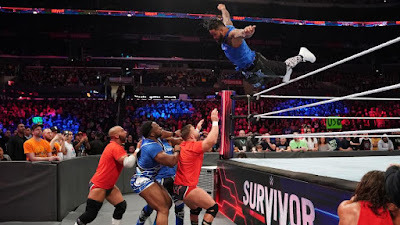 In spite of a few flaws Survivor Series 2018 was far and away the best main roster show of the year, one that really gave the superb NXT WarGames show a run for its money (full review of that show forthcoming). I'd call this the best Survivor Series since the two original ones from thirty years ago. Fun elimination matches, an excellent cruiser match and three fantastic dream matches, all aided by a hot crowd and an announce team that for once seemed motivated. WWE is fully capable of putting on good PPVs consistently, which makes it so frustrating when they don't. What I'd Change: Shane should've been knocked out much earlier, Joe should've lasted deep into the match, and I have no idea where they're going with RAW sweeping Smackdown. Why does Vince hate one of his own brands so much?